Retinol is an increasingly popular buzzword in the world of skincare. Retinol has been used as an active skincare ingredient since the late 1990s, when dermatologists began prescribing it to patients in order to improve the function of the skin, as this substance is the natural, topical form of vitamin A (a vitamin crucial to healthy skin). It has since been incorporated into a variety of anti-aging and rejuvenatory skincare products. Retinol SA is an example of a skincare development that has stemmed from the Retinol platform, but in order to understand Retinol SA, one must first understand exactly what Retinol is, and how it functions in skincare. Retinol is used as an anti-aging solution, to restore youthfulness to the skin by evening out skin tone and texture. If the Retinol ingredient is pure, stable and of sufficient concentration, it can reduce the appearance of skin discoloration caused by sun damage, and smooth out fine lines with continual use. However, the effects of topical application of Retinol (often referred to as retinal and retinyl palmitate on ingredients lists) depend on its concentration, as this vitamin A derivative is known to be vulnerable to air degradation. The purity of the Retinol is imperative to its effectiveness, and therefore so, too, is the quality (and packaging) of the product. The packaging of the product should be airtight, so the Retinol isn't subject to significant degradation in the hands of the consumer. With consistent and continual use, Retinol is effective in fighting and reversing the signs of aging. It is not as aggressive as its cousin, Retin-A, and is therefore suitable for sensitive skin. This gentleness allows the product to be gradually incorporated into a daily skincare regimen without the risk of unwanted side effects. Although Retin-A can penetrate the skin instantly, and work faster and harder than Retinol, it can also result in skin irritation, such as itchiness and redness. Many patients prefer Retinol over Retin-A, despite it taking longer for Retinol to show desired results. The "SA" in Retinol SA stands for "sustained action." In March 2009, the cosmetics and skincare company Neutrogena released a new line of anti-aging products called "Ageless Defense," designed to make it easier for women to select effective products to fight the signs of aging in the skin. The products include special ingredients, one of which is Retinol SA. Retinol SA is an ingredient patented exclusively by Neutrogena. The company claims that Retinol SA is distinct from Retinol (and deserved a patent) because of its ability to penetrate the skin and continue to work for 12 hours after its application to reduce skin discoloration and fight the appearance of fine lines and wrinkles. Retinol and Retin-A are often confused, and are two terms too often used interchangeably. They are both derivatives of vitamin A, although these active ingredients are distinct from one another. Retin-A, or retinoic acid, which could be thought of as the "distant relative" vitamin A, is a converted version of Retinol that has a much stronger and more aggressive effect on the skin. Retin-A can yield dramatic effects on the skin much more rapidly, as it can quickly penetrate the skin, trigger collagen growth and new cell turnover, and, therefore, reduce the appearance of wrinkles and skin discoloration. Yet Retin-A also has a higher risk of side effects, such as skin redness, itchiness and sometimes rashes. Retinol is much better for sensitive skin. Combining different active anti-aging ingredients can not only produce unwanted side effects, but can result in the ineffectiveness of one or all of the ingredients in some combinations. Also, because of their exfoliating functions in skincare, most active anti-aging ingredients, such as Retinol, Retinol SA or Retin-A, result in skin that is significantly more sensitive to UV rays, and therefore more likely to exhibit the sings of aging if it is not well-protected. 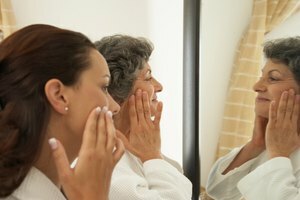 For these reasons and to be sure that the anti-aging strategy is both safe and effective, it is crucial to consult a dermatologist before incorporating ingredients like Retinol and/or Retin-A into a daily skincare regimen. What Are the Benefits of Vitamin-C Serum for the Face? Will Retin A Shrink Large Pores on the Nose?